Viking Skull was almost dead as the hollow-eyed skull that adorns their third release. Road life and disappointments took their toll in 2006 causing the band to nearly all hope. But fate (or providence) can be a mysterious taskmaster. After all, 2005's 'Born In Hell' was pretty darn good and gave Viking Skull some well-deserved recognition. The band regrouped, traveled to Philadelphia, and recorded 'Gloom, Doom, Heartache & Whiskey, a massively entertaining proposition of old school (very) heavy metal smiling upon the legacies of Sabbath, AC/DC, and Motorhead among others. O yeah, Classic Rock's new venture Powerage Records signed them in 2008. First impressions from the first track my find some people thinking this is another resurrection of doom or stoner metal, but they'd be wrong. Don't mistake Viking Skull's stocky rhythm section for something plodding. Rather, it's a solid backbone and a sure foundation putting the heavy into Viking Skull's metal. Just as remarkable are Roddy Stone's razorblade and whiskey soaked vocals; move over Lemmy, you have a major protege here. Top this off with some gripping and ripping fret work and you the makings of a tight band and a solid disc of music. As for the songs, here are some highlights and favorites. After the mighty and raw 'Start A War,' Viking Skull delivers an awesome groove and a tip-of-the-hat to Black Sabbath on the ferocious 'In Hell. 'Hair Of The Dog' displays the brilliance of the rhythm section, but it's the fantastic drumming and guitar solos that sell this short song. For sheer speed complimented with a traditional metal groove look to the memorable 'In For The Kill.' On '19 Swords' Viking Skull again reaches deep into Sabbath-ish metal style for some glorious battle metal. The real kicker and total surprise is the closer, 'Drink.' After all this heavy metal, you're not expecting a near blues shuffle paired with a piano that sounds like it was rolled straight out of an old West saloon: a clever and creative piece of music. I glad Viking Skull didn't throw in the towel. 'Doom, Gloom, Heartache & Whiskey' is a great work of hard rock and heavy metal. Viking Skull takes roots metal and rock from the past and nourishes them with sweat and whiskey to create some kickass music for a new day. 'Doom, Gloom, Heartache & Whiskey' is a great work of hard rock and heavy metal. 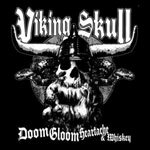 Viking Skull takes roots metal and rock from the past and nourishes them with sweat and whiskey to create some kickass music for a new day.